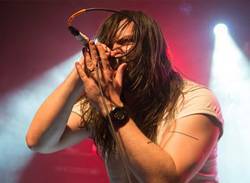 Features › Interviews › Andrew W.K. The thing that's most remarkable is how calm he is. An hour ago Andrew W.K was leading a sold out show in sing-a-long choruses and multiple stage dives. but as I enter the back room of this small club, I find him looking over the itinerary for the next month of his tour and quietly drinking bottled water. He's sober and calm. The performance has obviously taken a lot out of him. I'm still half drunk and covered in sweat from the show, so there's a part of me that's having trouble putting together how the man I'm meeting in this green room is the same man I just watched electrify an audience. I'm half expecting him to jump up and start yelling wildly, or hit himself in the face until he bleeds from the nose, but instead he makes an introduction and the two of us begin to chat. That's the thing about Andrew W.K. The man has created an identity of near mythical proportions all centered around his PARTY HARD philosophizing, to the point where there are rumours that the whole persona was created by record executives or Lower East Side performance artists. Regardless, people have firm expectations about who he is and what he does, and while many musicians would find those kind of expectations limiting, Andrew doesn't seem to mind. The niche that he's carved out for himself is extremely well-defined and the singer embraces the character he's created through social media, an advice column with the Village Voice, and in various television appearances. This is why I find our conversation so disarming. I had prepared myself for an interview with the unwieldy, unwashed, PARTY monster. and while Andrew was still dressed in his all white uniform and is still vaguely greasy, what I got was something different. He's intelligent, self-aware, and extremely humble. It's clear that the PARTY HARD persona isn't an act, but it's also clear during the brief time we spend together that the persona isn't all he is. The following is a transcript of our chat at The Hard Luck Bar in Toronto after Andrew W.K's solo party show. Scene Point Blank: How was the show for you tonight? 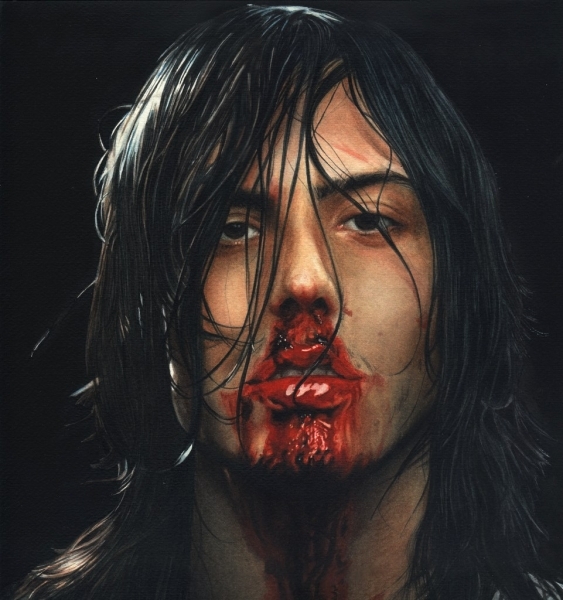 Andrew W.K: I had a very, very, good time. Everything sounded great. I obviously can't complain about the very enthusiastic folks who came. It was a joy and a pleasure. It takes me awhile to put the pieces back together after something like that, in a good way. Scene Point Blank: The concert you just played was billed as a solo party performance. How does that differentiate from a full band show? Andrew W.K: It's how I started playing. Before I had a band I played shows like this all the time. I don't like to abandon anything that I've done. I think of it like a tree: there's a trunk, there's roots, and there's many branches. I don't want to chop down my own tree, at least not yet, maybe I'll do that someday. Right now I'm still growing this tree. This is how I began and these kinds of shows give me such joy and power. They're just energy. The spontaneity of playing and knowing that I can do whatever I want to do -- I like that a lot. It's pure joy. It's like me playing at home by myself except there are a bunch of friends with me. It means a lot. It's energy. They fuel me up. Scene Point Blank: Performing is like a tree? 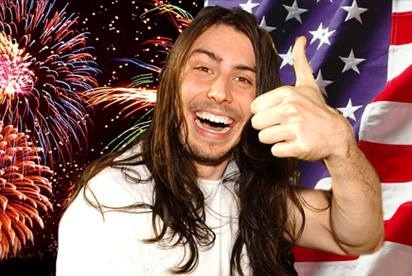 Andrew W.K: I did the best I could. It was a quiz show last night, and the questions were challenging but I did the best I could. I think I got seventy five percent right, which was more than I anticipated. I was guessing I would do very poorly but I think I did alright. Scene Point Blank: The reason I bring it up is because you've been involved with a wide variety of projects. Are these things that you seek out or do they usually find you? Andrew W.K: When people ask me, I do it. That's how I work. People ask to have me participate in their events and ninety-nine percent of the time I say yes. If I don't it's probably because I've already got something else to participate in. I don't really try and plan out my life too much anymore. I just follow the path that's been set out by whoever asks. "I don't really try and plan out my life too much anymore. I just follow the path that's been set out by whoever asks." Scene Point Blank: You seem to keep busy all the time. Andrew W.K: There's times that I'm not that busy, and then there's times when I'm going all the time. I was thinking about that today. When it rains it pours. For the last few months I've been at home working on my book and there wasn't a lot going on. I mean, I was still in New York, so there's always something going on. Then a week ago I get flown to Los Angeles for a bunch of meetings and tapings. As soon as that happened all these different opportunities and requests start coming in. Things I'd been working on and hoping for—sometimes for months, sometimes even for years—start coming together. When you're working it's like a magnet. You work and it gets stronger and starts drawing in other stuff. I try and do the best I can, so I don't end up feeling like I've just been lazy and missed things. It's good to push yourself. If someone's going to be hard on you it should be yourself, because that's the one person who—even if you get mad at them—you can't leave. Scene Point Blank: Do you ever get tired of people asking you about partying? Andrew W.K: Not really. To me it's the greatest that someone wants to ask me about anything. I'd rather they ask me about partying, which is someone very fun, and that most people like, than anything else. I can think of a lot of things: tomatoes, math, harming people. I try and focus on a very cheerful activity. I try and spend all of my time and energy engaged in that. It feels good to me to be around people. Like tonight: how can you not feel good when everyone is being so nice to you, and so excited and so cheerful? It's the greatest thing. This is what these shows do. It blows my own mind. In the chaos there are these moments of clarity and I think that I can't believe this is happening. I can't believe that, of all people, I'm getting to do this. I just feel very humbled and very fortunate. "In the chaos there are these moments of clarity and I think that I can't believe this is happening." Scene Point Blank: Does playing shows like you do, and keeping up the kind of energy you have, ever make you feel worn out? Andrew W.K: I get tired and stuff, but there are a lot of people working way harder physically than I am. At least this is fun to do, and sure it's taxing on your body, but there is so much cheerful good energy in what I do that it's worth it. Scene Point Blank: When people think of Andrew W.K they tend only think of you as “the party guy.” Do you ever feel like that idea is limiting or holds you back? Andrew W.K: That's a very excellent question. I think I create a doorway, or entry point, much like an index - where the index can be something as simple and as vast as life. Once you dive down there the index can be anything. To me the feeling of being happy and being alive is great. I celebrate not being dead. I want to do something that's very digestible, understandable, definable, and relatable in concept. I mean, someone's grandmother and someone's four year-old kid can both understand what it's like to have fun. Within that idea I get to do whatever I want. I try to come up with a way to do that for myself and hopefully I can do that for other people. Scene Point Blank: But do you feel like it's limiting to constantly be the fun guy? Andrew W.K: Limiting in the best way. Being the fun guy is the entry point, it's the doorway, but the entry point has a world within it once you cross through. That's true of anything I guess, but if you choose my doorway I'll be the one going there with you as opposed to someone else. Like Dr. Phil. Scene Point Blank: Like Dr. Phil, indeed. Is there anything you'd like to add for the tape recorder as we finish up this evening? Andrew W.K: Keep going. Don't get bogged down. Not just you, specially, Graham, but anyone who might be reading this. Don't take anything too seriously that you let it bog you down but, even if you do, that's okay too. Don't take that too seriously. It's a very intense experience to be alive and sometimes you can just let it pass over you without having to make any decision about it. You can be sad and not have to do anything about it. You can just keep surviving and living and maybe you'll learn to enjoy the feeling of being sad until it makes you happy. There are all different flavours of ice cream and candy bars out there. It's a very vast flavour experience out there and it all counts. Words by Graham Isador on July 6, 2014, 6:17 p.m.
Main photo by Andrew St. Clair. Posted by Graham Isador on July 6, 2014, 6:17 p.m.
Posted Sept. 24, 2017, 11:31 a.m.
Posted June 13, 2017, 9:31 a.m.
Posted July 20, 2010, 4:31 a.m.
One Question Interviews Andrew W.K. Posted Oct. 22, 2013, 7:50 a.m.